Soon after his passing last year, we students wanted to find a way to pay tribute to our teacher, mentor, host and friend, Bernd Jager. Bernd was a psychologist firmly rooted in the humanities, whose boundless curiosity about the human world played out around the themes of hospitality and presence. We worked with the photographer Elizabeth Knox to shoot and curate a series of photos of his home and work, celebrating these themes. For many years, Bernd warmly welcomed his students to his Thursday night salons. We gathered around his long, elegant dining table to raise a glass, and share our work, our ideas, our lives, and, of course, dessert. 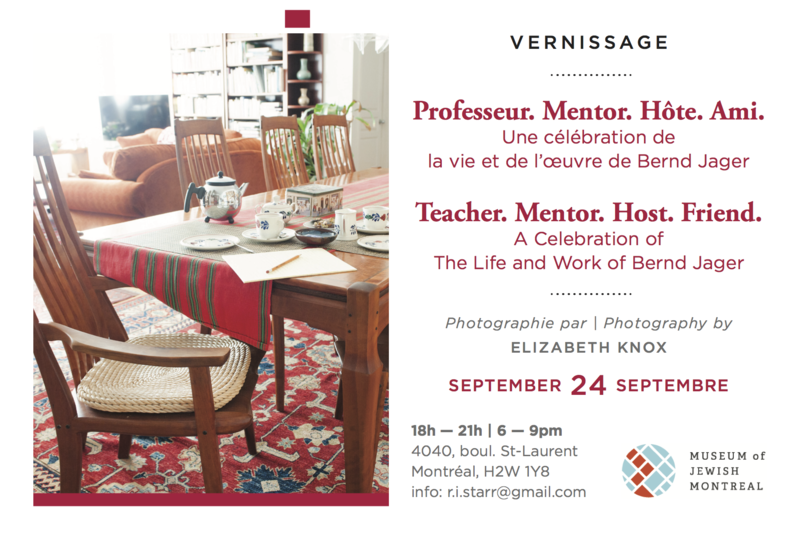 In honour of such festive and contemplative moments, we cordially invite you to the vernissage of these photographs on Saturday, the 24th of September, at the Museum of Jewish Montreal (4040, St-Laurent Blvd. ), from 6-9pm. Peu de temps après la disparition de Bernd Jager, nous — ses derniers étudiants — avons souhaité immortaliser l’atmosphère de son appartement par une série de photos. Dans ce lieu, des générations d’étudiants ont été accueillis avec hospitalité et bienveillance. Tous les mois, le jeudi soir, nous avions rendez-vous au centre-ville de Montréal pour une soirée de partage en bonne compagnie autour de nos travaux, de nos lectures — accompagnés par une coupe de vin et de délicieuses pâtisseries. Nous avons tous gardé en mémoire l’ambiance sereine et amicale de son intérieur, renforcée par les tons chaleureux du mobilier. C’est pour conserver la mémoire de ces moments festifs, que nous avons souhaité organiser une exposition des clichés prises par la photographe Elizabeth Knox. Vous êtes cordialement invités au vernissage de cette exposition, le samedi 24 septembre 2016, au Musée du Montréal juif (4040, boul. St-Laurent), de 18h00 à 21h00. 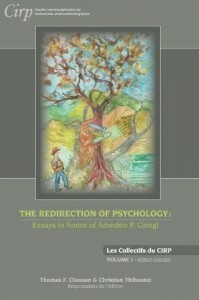 Published in February 2014 and available on Amazon, this original publication wants to honor Professor Amedeo P. Giorgi, as a world-renowned and innovative psychologist and as an eminent former colleague, who, more than a decade ago, reinforced and expanded phenomenological psychology in UQAM. In the ensuing years the university has attracted a growing number of gifted teachers and students whose interests coalesced around the idea of a human science of psychology that would no longer model itself exclusively on the natural sciences but that would draw its main inspiration from the experience of concrete living. Today these psychologists form a unique and fertile group of professors and students within the university’s psychology department. The contributors to this bundle of essays live and work in all corners of the world, from England, Canada and the United States to Sweden, South Africa and Japan. What the authors have in common is that they all are former students and colleagues of Professor Amedeo Giorgi. The essays collected in this volume are meant to express their appreciation and gratitude for Amedeo Giorgi’s tireless teaching, for his great scholarship and erudition and, last but not least, for his unfailing collegiality and loyal friendship.